The Apollo 55000-400APO is a standard 55 degrees heat detector from the XP95 range of equipment. 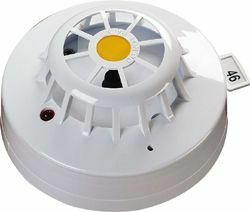 This detector has a sleek low profile design and is suitable for use on BS5839 compliant fire alarm systems. The Apollo 55000-400APO uses the Xpert card system for setting its unique system address. The Apollo 55000-400APO detector is part of a wide selection of Apollo XP95 fire alarm system equipment. This range includes smoke detectors, heat detectors, multi-sensors, call points, interfaces, sounder & beacons. This equipment can be used to overcome almost any fire detection obstacle. If you’re interested in this detector you may also be interested in the Apollo Discovery Call Point and Apollo XP95 Call Point ranges.